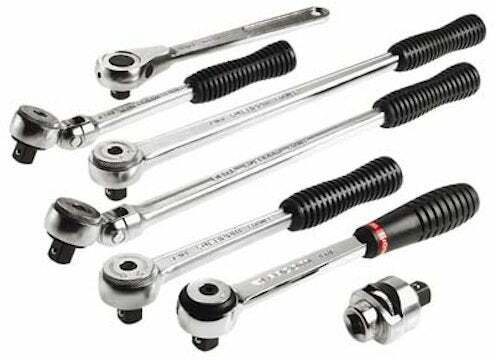 Tool sets are popular gifts, but none is more useful for the home and garage handyperson than a really good ratchet set. Ranging between $40 and $140, however, not all were created equal. Here’s what to look for: Start with the ratchet head and look for a quick-release button on the back. This means the sockets will stay on and come off when you want them to. For jobs in tight spots, a lever-activated reverse mechanism wins out over a dial. A ratchet head with a low tooth count will also give you more control with less backswing in tight places. The socket themselves are all pretty accurate from brand to brand, but the new laser-engraved markings are much easier to read. Useful accessories include socket adapters for your drill, extension bars, wobbles and flex heads (to allow you to work around corners). Don’t overlook the case—there should be a marked place to everything, the pieces should come out easily, and hinges and latches with metal pins will last longer.